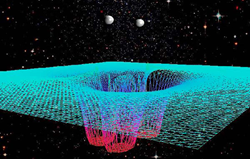 Rochester Institute of Technology scientists' research was integral to the breakthrough detection of gravitational waves from binary black holes that was announced today by the Laser Interferometer Gravitational-wave Observatory (LIGO) Scientific Collaboration. RIT scientists produced one of the first computer simulations of gravitational waves from colliding black holes. Rochester Institute of Technology scientists' resaerch was integral to the breakthrough detection of gravitational waves from binary black holes that was announced today by the Laser Interferometer Gravitational-wave Observatory (LIGO) Scientific Collaboration.